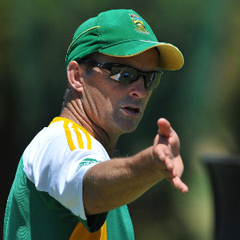 Kirsten to extend SA stay? Cape Town – Barack Obama has his “four more years” … reading between the lines, it would seem as if popular South African national cricket coach Gary Kirsten is primed for a further two or thereabouts in his own post. Kirsten, who is about to mastermind in his customary, mostly out-of-the-spotlight way the Proteas’ latest quest to win a keynote Test series -- against Australia starting in Brisbane on Friday -- is not the type to put the cart before the horse or to unreasonably pressurize his Cricket South Africa employers in the public realm over contractual issues. But it seems as if he would be prepared to extend his tenure if all parties are content with that scenario. In a comprehensive interview with Sport24 ahead of the three-Test series Down Under, the former India coach and SA opening batsman said he had “enjoyed the work” in his first full year in charge, where the Proteas have climbed to the top of the ICC Test rankings. His terms will be up for potential renegotiation in less than a year, because he only took the role on a two-year initial deal and after much thought because of the attached sacrifices to his family life. Explaining the relatively short first-up contract, Kirsten said: “I felt it would be easier to potentially renew a contract that we felt was working … rather than have to break one, perhaps, that wasn’t. So both parties get an opportunity to reassess. “Having started out my coaching career with India, I came into a completely different environment with this job -- that very difference has been enjoyable. “One thing I did always know was that I’d be joining a quality cricket team. We’ve always known our Test side was really good but to see them now take another big step up and go to No 1 – where we’re determined to stay – has been particularly satisfying. “The Test team ... we’ve got the right people on the bus there. Really quality players. Obviously injuries can be an issue; do we have depth in certain areas? That’s an area we’re focusing on: where do we need to bolster up, and expose guys more? “But the current XI is just a quality combination. The ODIs and T20s ... it was always going to be an exploratory time. AB (de Villiers) is the new captain there and it’s been big shoes to fill, obviously. I think he’ll just grow and develop; we need to be patient around that. We also need to be patient in understanding our resources in those formats of the game. You are well-rooted to this country in general life terms; can you ever see yourself being able to be reasonably nomadic again in the future? I think these days there are lots of opportunities in the shortened form of the game – T20 is all around the world now, and I believe they’re setting up an American league next year which will be very exciting. Listen, if you asked me for first prize I’d still say coaching an international team; you get to connect with people over significant periods. It’s an interesting one because most of the coaches are young coaches: Andy Flower’s got that same issues; a guy like Justin Langer has a young family too. Andy I have had a few chats when we’re on the road and agree that it’s not easy balancing your life. But from a family perspective you also realise it’s not going to be a long-term thing. At the end of the day I was fortunate to do three years with India. Maybe – although one never knows -- it’ll be three and a half years with South Africa (presumably to the next World Cup in 2015 – Sport24). That’s six and a half years which is not a huge chunk of time in a broader (context). Do you have any aspirations outside of cricket? I have been fortunate that cricket has been part of my life for a long time. It has been a way of life for me. After I finished playing I set up my own cricket coaching school, which I thoroughly enjoyed. Working with young people and helping them to be the best they can be, is a privilege as well as a massive responsibility. It was during this time (2006) that I had a vision to build and design a cricket academy that would be of world class standard and accessible to anyone. With the help of some businessmen who have a real interest in seeing this project work, we have made significant progress in the development which is located at Claremont Cricket Club. We still have a way to go but my dream is to build a facility that will be a legacy for South African cricket. Was that England Test series win as satisfying for you as any, either as South African player or coach? Oh yes, without a doubt. I was so chuffed for the players. For me, although you’re accountable for performances as coach, I believe you sit in the background, and do the work leading into a match. When the players go onto the field they’ve got to make the play; I was so pleased they stood up mentally to the challenges they were confronted with – of which there were many. I think we really stepped up, and I proud of the way we put that tour together. We started with that exercise in Switzerland and I had a feeling it was going to be a watershed, ground-breaking kind of event. It will long live in the memory of those players. They still talk about it. Is it true to say South Africa showed welcome, start-to-finish intensity on that tour? What I really liked about that series was how we had different players stepping up at different, crucial times for us. We weren’t just relying on one or two or three guys. I mean, Alviro Petersen’s 180 at Headingley ... he had been battling through the tour to that point. And then, boy, did he make his play. I knew he was going to do it: he’s a quality player. JP Duminy made some telling contributions at seven. I just felt comfortable that at crucial times we’d always have guys who could step up in pressurised situations. On the bowling side too, everyone contributed. Even Immy (Imran Tahir) who didn’t get as many wickets as others, played an important role at times; ditto Jacques Kallis as our fourth seamer. It was a mentally draining series, but the guys really stepped up. There was no opportunity to back off; we had to be on our A-game so much of the time.